UPDATE #2: Natalynne DeLapp, development director for the Environmental Protection Information Center (EPIC), said in a phone interview that the petitioners are disappointed in this ruling, though she stressed that the case is not over. (See the "reporting and monitoring order" referenced below.) More significantly, DeLapp said, is that the project remains on hold pending the remapping that was ordered by a federal judge last year. "For us, I take solace and comfort in the fact that the grove is still protected because of the federal injunction," DeLapp said. UPDATE: Here, in pdf form, is the ruling itself, which reads as a systematic repudiation of the major claims from the petitioners, including a trio of nonprofit environmental groups: the Environmental Protection Information Center (EPIC), the Center for Biological Diversity and Californians for Alternatives to Toxics. Judge Reinholtsen starts off diplomatically enough, saying both sides presented "thoughtful, well-researched arguments meriting serious consideration." But the even-handed compliments end there. From that point the decision goes into exasperated smack-down mode: The judge calls petitioners "less than forthcoming." He describes one argument as a red herring and lambasts another as "nothing more than an exercise in wordplay." Point by point, he dismantles their case. For example, the judge dismisses the notion that Caltrans had a "secret agenda" to widen the roadway for STAA truck access by pointing out that Caltrans' made this justification clear from the jump, even going so far as to include EPIC on its mailing list. As for the old growth redwoods in question, Judge Reinholtsen says their value stems mostly from their visibility and symbolic meaning, rather than any ecological importance. Statistically, he says, they're an insignificant portion of the state's remaining old growth stands (decimated though they are). He concludes that the project won't ruin the "profound aesthetic experience" provided by these trees. "That is simply untrue, as Petitioners must know." The level of detail that the petitioners would like to see in the environmental documents is "uncalled for in CEQA [the California Environmental Quality Act], and indeed possibly unlawful," Reinholtsen concludes. The petitioners argue that Caltrans failed to consider the effects of increased STAA truck traffic through the grove. This, Reinholtsen says, is a "red herring." He says there's no reason to believe there will be an increase in STAA truck traffic. "Petitioners appear to simply assume that it would." Caltrans suggests truck traffic would actually decrease thanks to the larger capacity of STAA trucks. Even if it didn't -- "even using assumptions that are extremely generous to Petitioners," Reinholtsen says -- the project's cumulative impacts on truck traffic would be insignificant, he concludes. We are simply not talking about effects that 'when taken in isolation, appear insignificant, but when viewed together, appear startling.' ... We are instead talking about effects that when taken in isolation, appear absolutely trivial (or even non-existent), and when viewed together appear a little less trivial. The only potential impact of the suit on Caltrans is a requirement to adopt "a reporting or monitoring program ... designed to ensure compliance [with CEQA] during project implementation." The judge ordered the parties to meet up and work out an agreement on the particulars to ensure this happens. Original post: A Humboldt County Superior Court judge today ruled that Caltrans' Environmental Impact Report for the Richardson Grove Improvement Project does not violate the California Environmental Quality Act, according to a press release issued by Caltrans. The battle in federal court remains on hold pending mapping revisions. "Caltrans is not going to cut down or otherwise remove any old-growth redwoods from Richardson Grove State Park... There is absolutely no basis in reality for believing that Caltrans ‘wants' to ‘destroy' old-growth redwoods. The evidence is quite obviously and overwhelmingly to the contrary." The decision concludes that "[t]he Court has not found a violation of CEQA [California Environmental Quality Act] at this time." In its 30 page opinion, the Court addressed and rejected the allegations in the Petitioners' challenge to Caltrans' analysis in its Environmental Impact Report. The Court decided that it needed additional information regarding only one aspect of the project: it asked Caltrans to show that it has adopted a reporting or monitoring program that is designed to ensure that it will employ the impact minimization measures discussed in its environmental study. The parties were requested to meet and agree on the timing for Caltrans to present this additional information to the Court. Today's ruling brings the challenges to the project a major step closer to resolution. Route 101 at Richardson Grove has been under study for more than ten years and Richardson Grove Improvement Project has been actively in development since 2006. 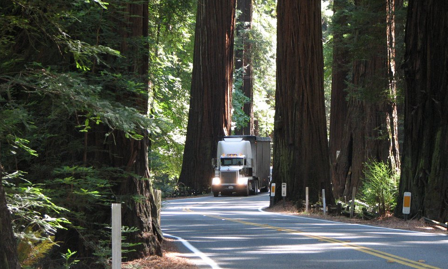 Minor changes to the existing alignment will be made without removal of any old growth redwood trees in order to allow industry-standard sized truck access along this portion of Route 101. As the court emphasized in its decision, the project was planned and designed to avoid removing any old-growth trees, and many measures are in place to protect the surrounding trees throughout the area.